Welcome to the Sponsor Training Section! 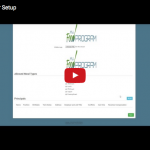 Below you will find step-by-step instructions for setting up your My Food Program account. This is meant to be the optimal method of setting up My Food Program. Certain features work better if you input data in a specific order, as it allows you to match up certain data fields. While there is no “wrong” way to enter data, this guide will walk you through in a way that will minimize your effort. 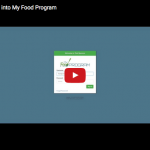 Be sure that you are logged into your My Food Program account and click on the topic below that you are interested in to learn more. You can also Download Our Full User Guide which includes the complete instructions. Download these templates in order to seamlessly upload multiple sites or participants at once. 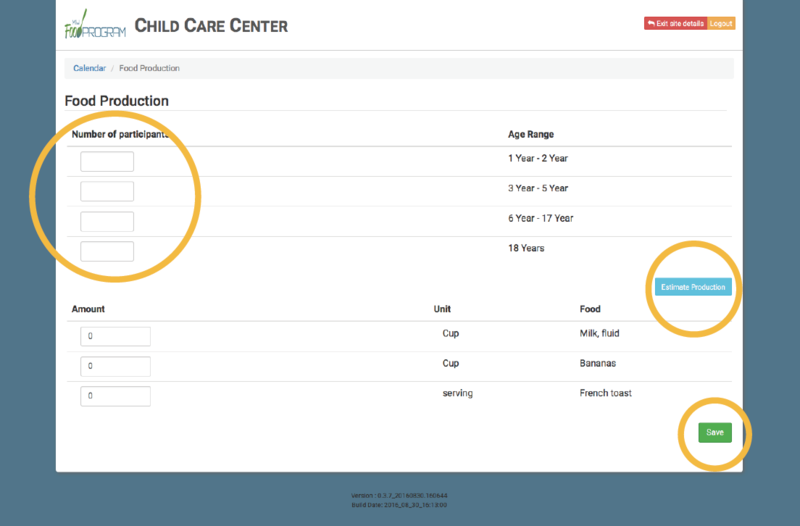 This template works best if participant names are listed as “last name, first name” such as in the Procare system. 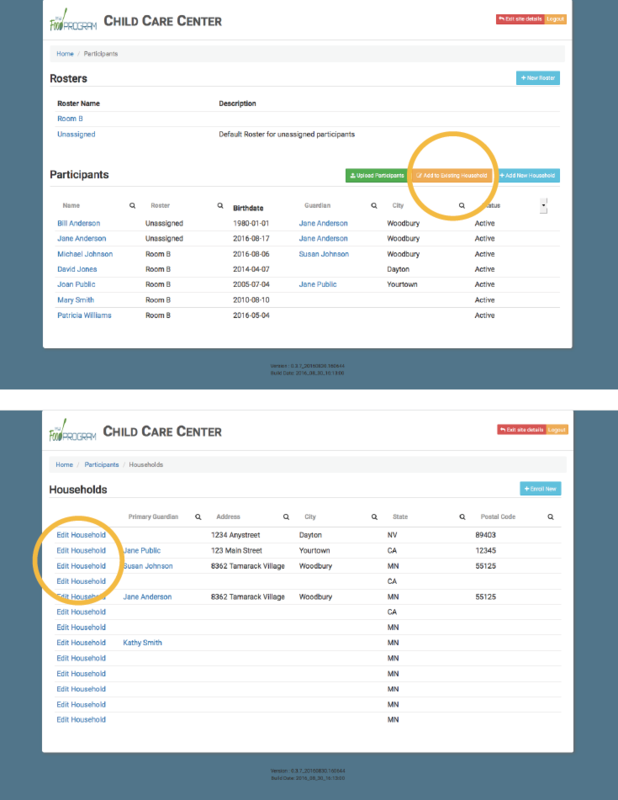 This template works best if participants last names and first names are in different columns, such as in the Minute Menu system. 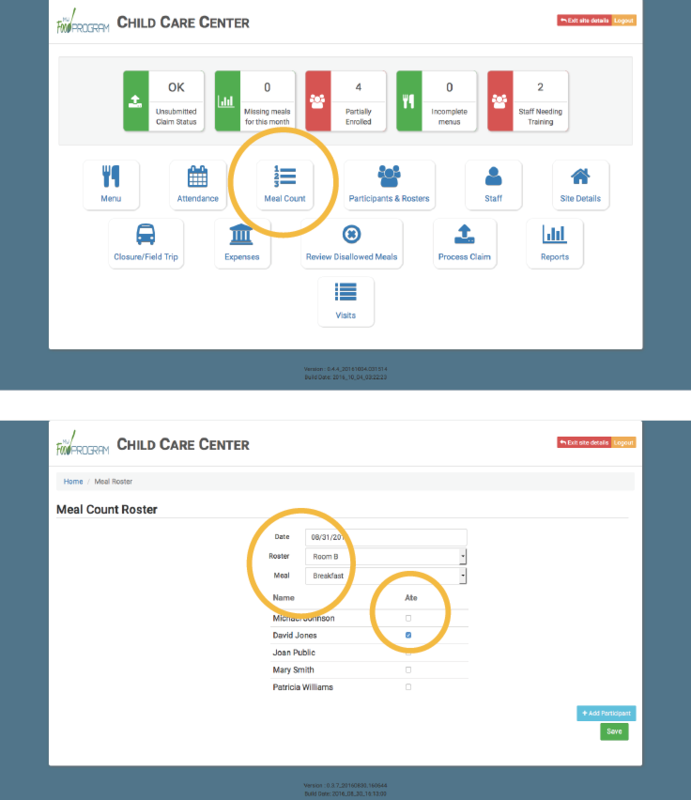 Please note that each access level will have a slightly different look to their dashboard. A sponsor has to be set up even if your location is self-sponsored. Be sure that you are logged in to My Food Program. Fill in all of the appropriate sponsoring information. 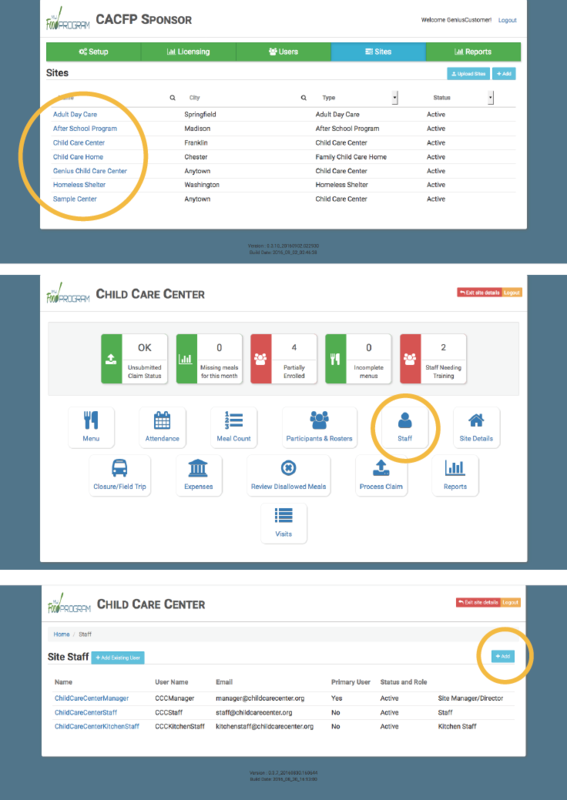 Here is where you are able to add your organization’s logo. If you are a sponsor of sites that are not required to be licensed in your state, simply create one licensing category called “All Participants” and put in the capacity of your building or facility. Setup Licensing for the organization. Without this sites can’t have licenses. The people in the SPONSOR organization who should have Admin and Report level access. The following is required: Site Name, Type, Legal Name, Site Identification Number, Status, Address, Daily Attendance Method, Meal Count Time Frame, Time Zone, and Meal Count Method. DON’T guess on the meal time, the software is smart enough to deny an attempt to serve a meal that doesn’t exist or if you try to serve it when it is not allowed. For this reason we recommend that these be set as generous as possible. 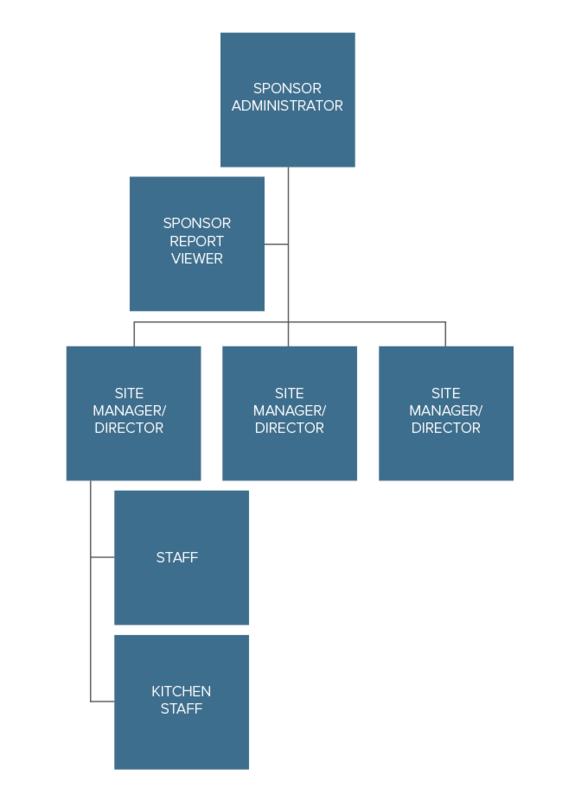 If your site is self-sponsored, remember to click “Site is Self Sponsored” this allows a site manager/director to have additional authority that is not granted to sites that have a sponsor. 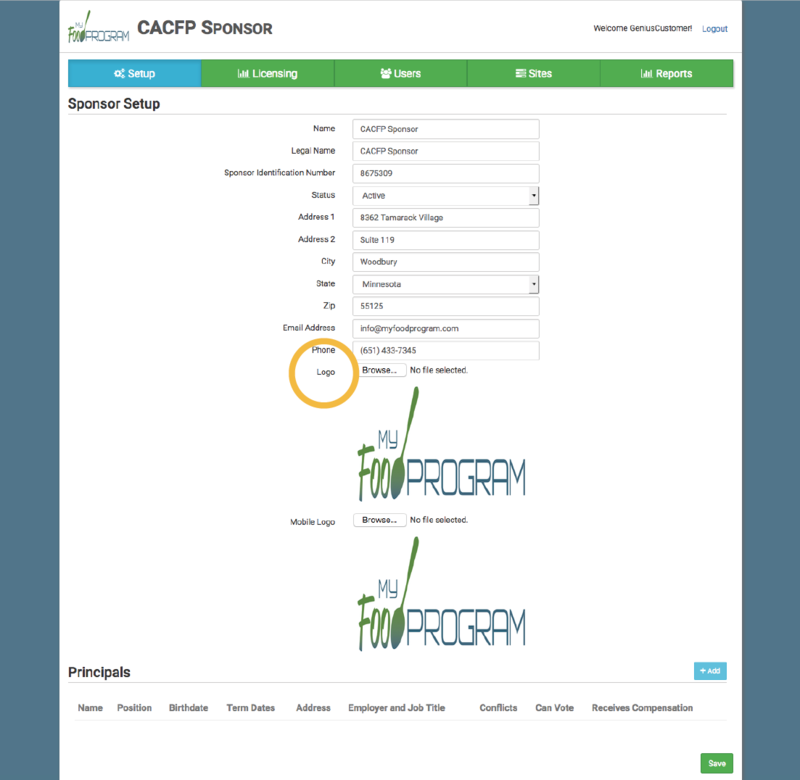 This option only appears when a center is selected, as they can either have a sponsor or opt to self-sponsor. Family Child Care Homes must always have a sponsor. 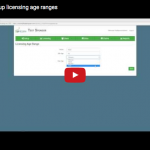 How many participants of each licensing age range is allowed). 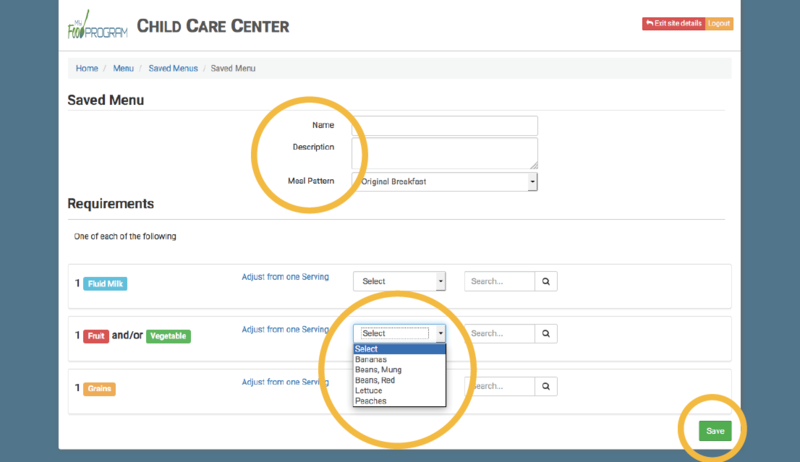 You may notice that Meal Patterns say “Original Breakfast” instead of just “Breakfast”. This is due to the fact that new menu guidelines from the USDA will take effect in October of 2017 (at the latest). During the time inbetween, it is possible that some sites will elect to move to the New meal pattern before October 2017. These will be labeled as “New Breakfast”, “New AM Snack” etc, as a way to distinguish them from the existing “Original” Meal Pattern. Sites must choose EITHER the “Original” OR the “New” meal pattern. Sponsor Admin Level Required. Be sure that you are logged in to My Food Program. Select the site that you added earlier. 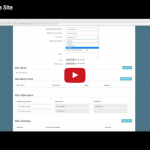 Add a site manager/director, set their password, and select if they are primary for the site. 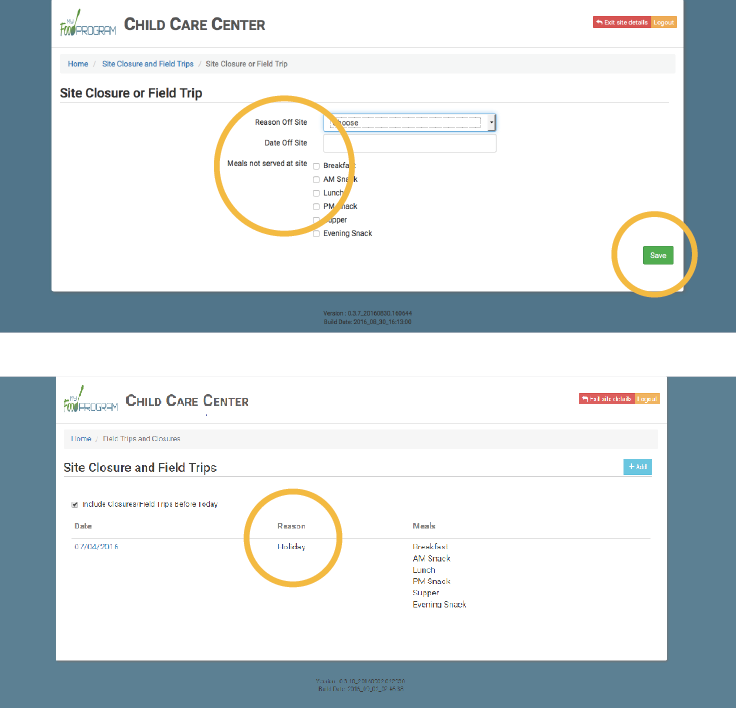 You can now add additional staff if you wish or have the site manager/director do it. Be sure that you are logged in to My Food Program. Select the site that you wish to add staff to. Make sure that all of the information is correct, especially meals, their times and site licensing. If these are wrong, contact your sponsor administrator and have them fix them before doing any menu planning. Site Manager/Director has access to nearly everything. 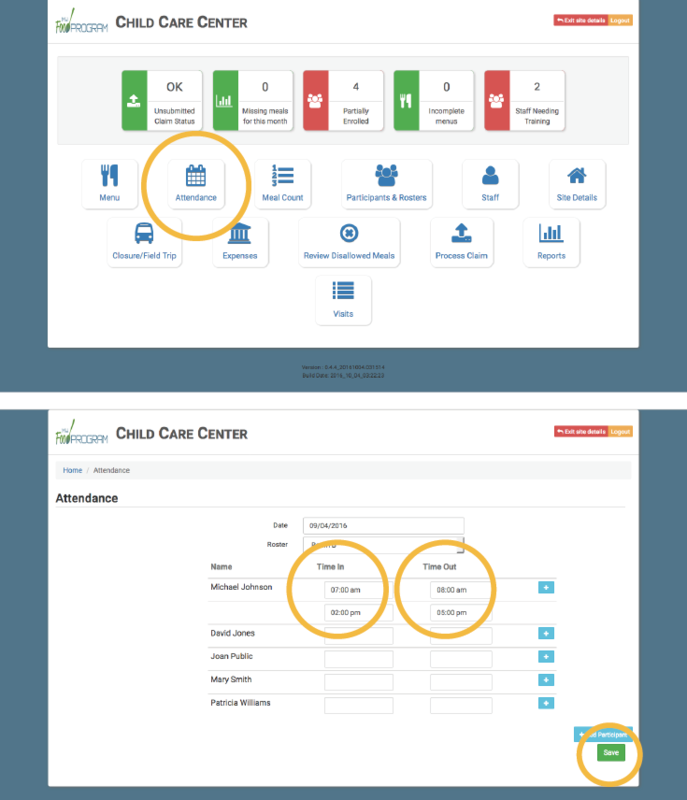 Staff has access to Attendance, Meal Count, Participants and Roster, and Reports (but NOT menus, food production records, etc.). 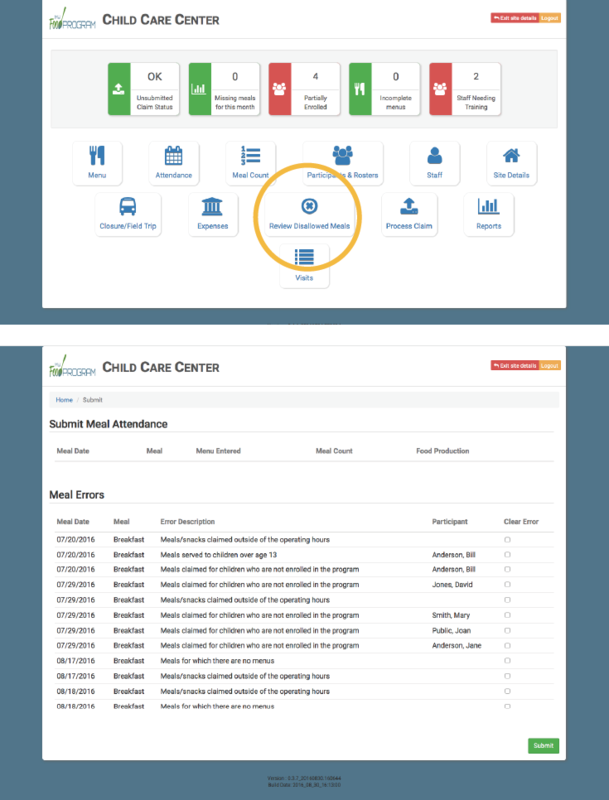 Kitchen Staff has access to Menu, Attendance, Meal Count, Closure/Field Trips, Expenses and Reports. They DO NOT have permission to add/edit rosters and see any personal information of the participants. Please see page 4 for more details on permission levels. 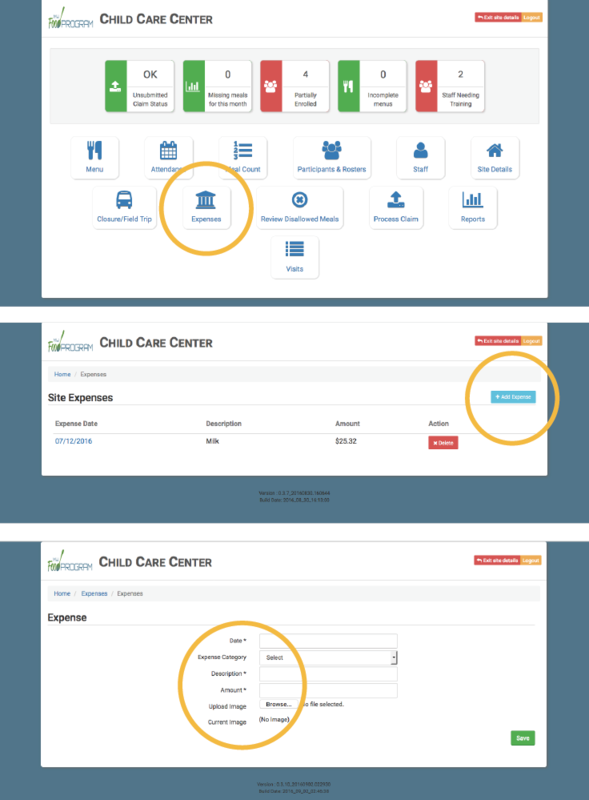 If there is an existing user, you can simply click the blue “Add Existing Staff” button to add their information. Menu Planning is usually done by the Site Manager/Director although Kitchen Staff and Sponsor Admin also have permission to edit. Be sure that you are logged in to My Food Program. Select the site that you wish to do menu planning for. You now see a list of all foods that are currently in our system. They are listed alphabetically within their respective categories (Meat/Meat Alternate, Grains, Fruit, Vegetable, Fluid Milk). DO NOT select all of the foods as your favorite, as it defeats the purpose of the feature. 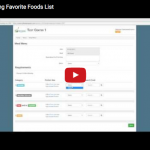 The “Favorite Foods List” is intended to contain only foods that you serve repeatedly and makes building a menu much quicker and easier. Click the box the left of these foods to mark them as foods you commonly serve. This will make them quickly available later. This will show you any menus that have been saved for this site, but aren’t specific to a certain day. To add a menu, click “Add Menu”. Then you will need to name this particular menu. As an example, if you served a breakfast of French toast, Bananas and Milk every weekday, you could name it “Breakfast”. You then need to select which meal pattern applies, in our case “Original Breakfast”. Note: Any menus added to your Saved Menus will be available from a drop-down menu on each day of the week. We encourage you to put in as many of your typical meals and snacks as possible to speed menu entry. Now you choose foods in each category using your Favorite Foods. You can always choose a food that is not on your Favorite Foods list. Type the name of the food in the search box on the right-hand side. The system sets the portion size to the right amount for the meal pattern. If you serve a portion that is bigger or smaller, you can change the amount by clicking “Adjust from one serving”. If you serve a smaller portion, you will need to add another food from the same category so the amount adds up and meets the meal pattern. When you are done entering the foods for your menu, click “Save” at the bottom. Note: The calendar contains only the meals that you are scheduled to serve over the date range that is specified. 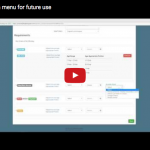 You can work into the future on menus by entering a future date in the drop-down menus. To add or change a menu, click on the meal name in the calendar. Click on the drop-down by Menu and select a saved menu. Remember to click “Save” at the bottom. The date and meal will now have a knife and fork picture. This means that a menu has been entered. Click on the date and meal that you would like to edit. Select the required food item from either your favorite foods, or type the food into the “Search Food” box and press enter. Continue this until all required components are populated. Click the blue “Edit Menu” button on the right hand side. Click the red “Remove” button on the right hand side to remove the item. 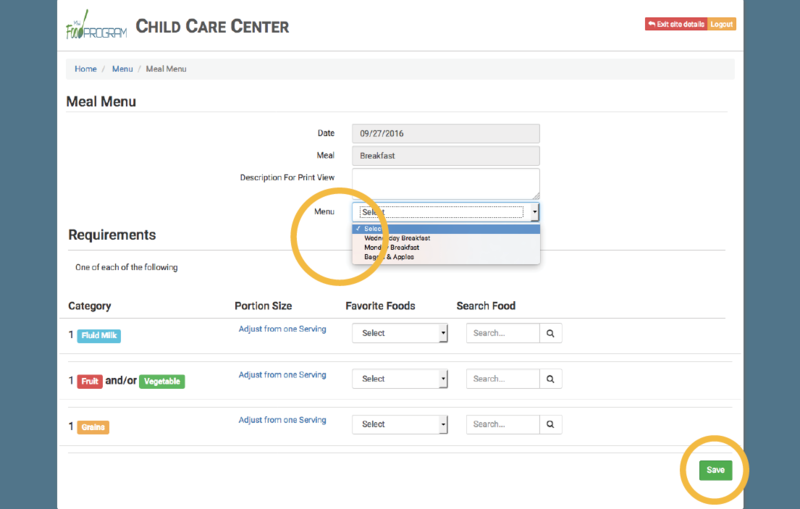 Either select your new food item from the drop-down list or type it in the search window and press “enter”. Click “Save” at the bottom. Only the meals that have been setup for your site appear in the “Menu” section. 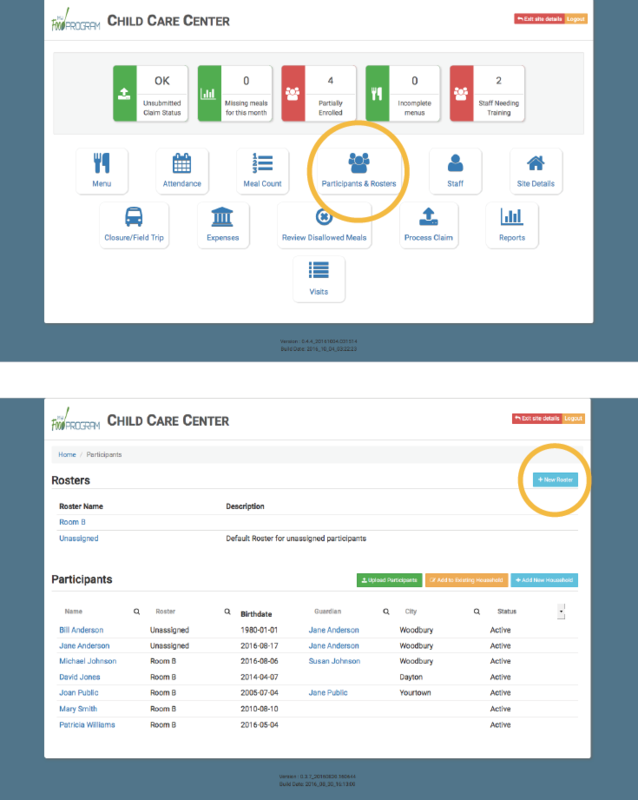 If you see meals that you do not intend to serve here or ones that you wish to serve are missing, please contact your Sponsor Administrator (probably the person who sent you your login information) and ask them to correct it. If there is a food that you wish to serve but it is not currently in our database, please contact us via email at info@myfoodprogram.com or by calling 651-433-7345. Our registered dietitian will review your request and determine if this food is allowed under USDA guidelines. If it is, we will add it our master list and everyone will be able to pick it when they refresh their browser or login again. Users with data files from other programs, skip to “6. 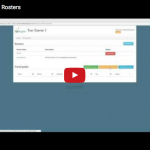 Creating Rosters”, if you are not exporting a file. Be sure that you are logged in to My Food Program. Then click “Upload Participants”. This will open a prompt for a file. Find your export file from the other program and click “Open”. The file will be read and a list of the contents will appear on your screen. It will highlight any that are duplicates and will NOT upload these files. You can also “Select All” by clicking the box at the top of the list. When everyone you want to add to My Food Program has a check next to their name, click “Save”. The participants and their rosters are now added to My Food Program and are available immediately to be recorded. **Important**If you have two participants with all of the same data (Birth Date, First and Last Name, etc.) and this IS NOT a duplicate person (such as twins with the same first and last name but without a middle name listed), you must add the second (and any additional) one(s) manually afterwards. If it is possible, make your export file from the other software include middle names or other unique data to prevent our system from recognizing them as a duplicate. A roster is a group of participants. 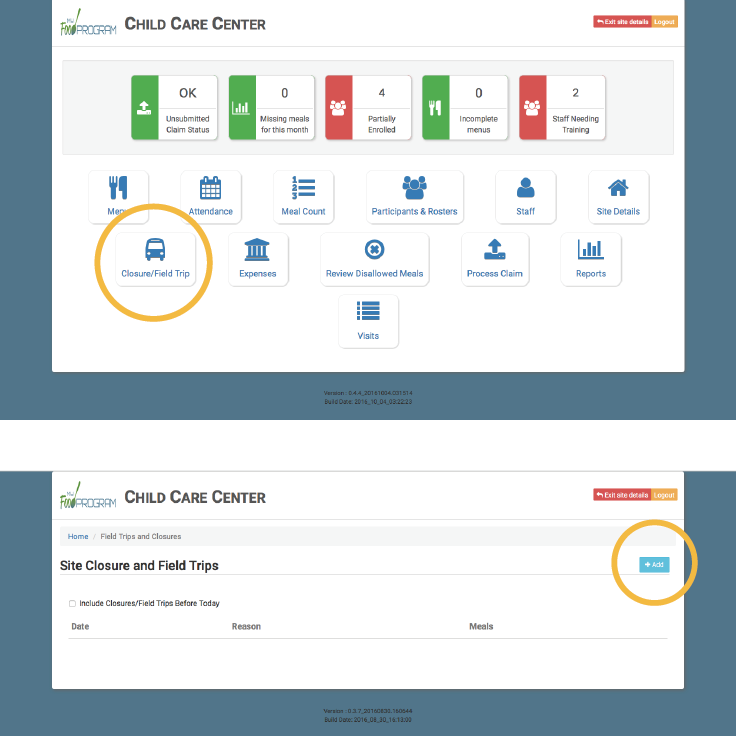 Most centers choose to have the rosters be classrooms or licensing age groups. There is always an unassigned roster for participants that aren’t assigned to a classroom. Be sure that you are logged in to My Food Program. Click the “Participants and Rosters” icon. There will be an “Unassigned” roster there as a default. Click the “New Roster” blue button. Longer names limit the text size on the mobile app and can cause the name of it to be difficult to read. You can enter a description for the roster or leave it blank. Click “Save”. Now your Roster is available on the “Participants and Rosters” screen. 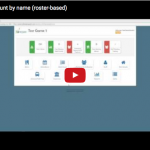 Add a roster for all your classrooms or age groups. Note: A participant can be on more than one roster at any given time. This is especially useful for children who are moving from one age group to another, or are on a different roster on a weekend and so may appear on two rosters simultaneously. 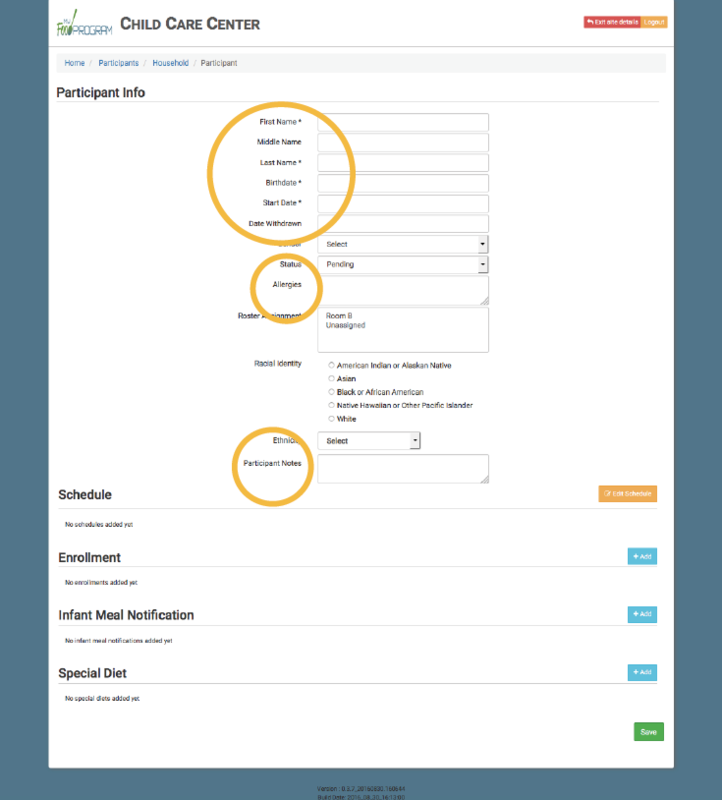 My Food Program does not limit participants to be only tracked by their corresponding roster. If a participant is selected by two people for the same meal (them being on two rosters as an example) it will record this as ONE meal being served and will ignore the second one. My Food Program links participants to households. 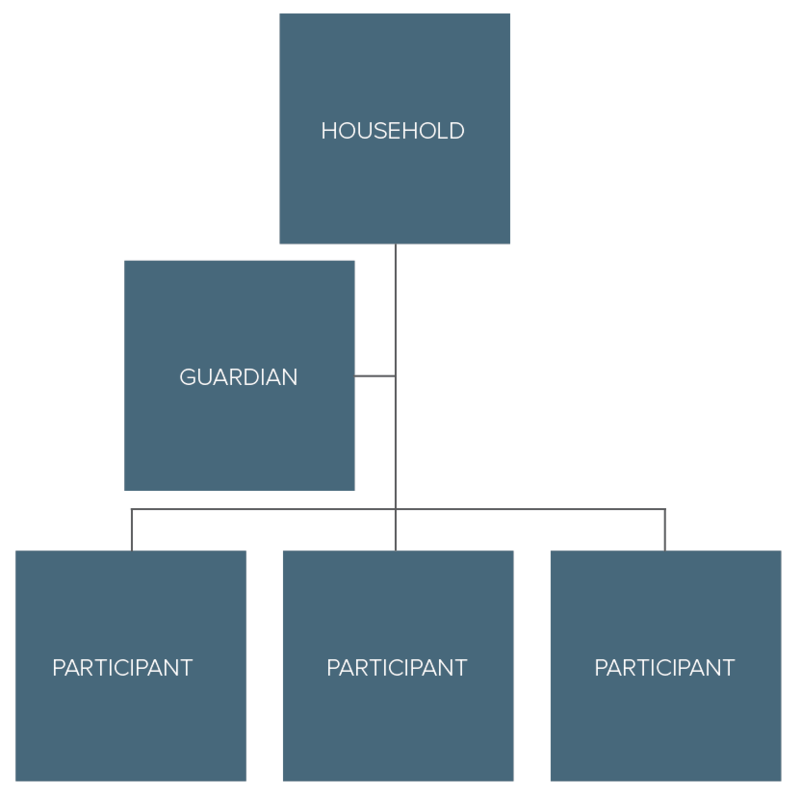 Participants in the same household have the same guardian, can share schedules and are linked to the same income eligibility form. Household information is not required for every participant. 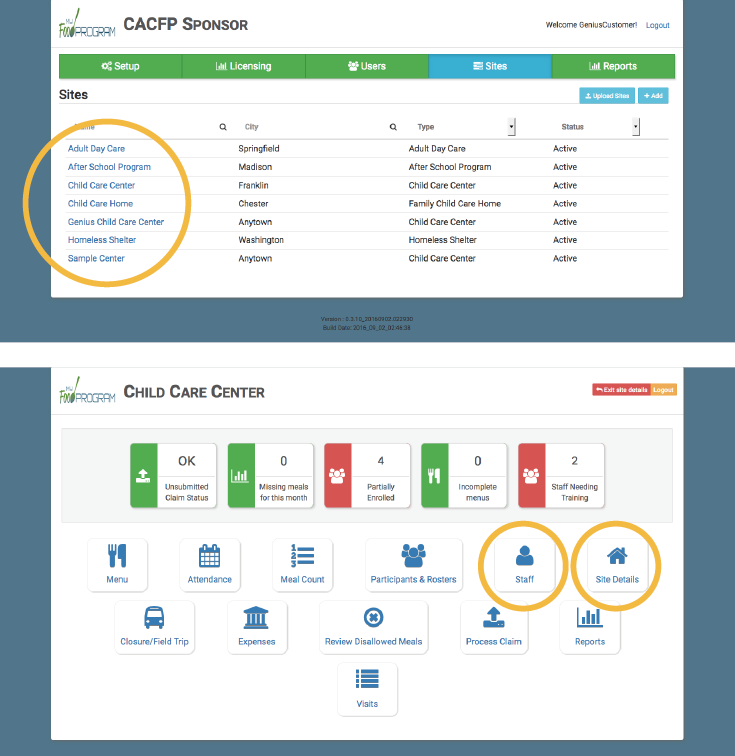 Active: Participant is enrolled in your center and all CACFP paperwork has been completed and is current. Inactive: Means that the participant is no longer attending your center. My Food Program does not allow users to delete participants once they have been entered in attendance or meal count. 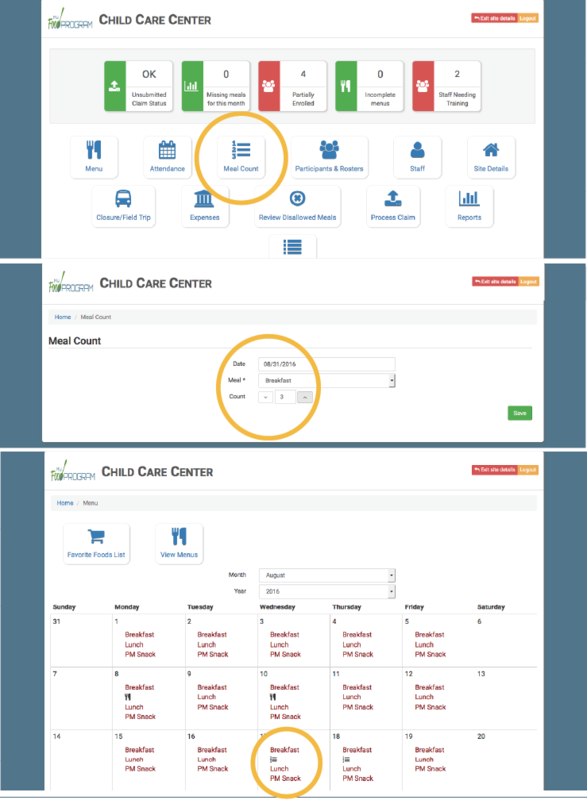 Changing a participant to inactive means that they do not show up on meal count or attendance rosters on the web or mobile application. Pending: This if for participants who will be attending at your site in the near future, but are not currently. 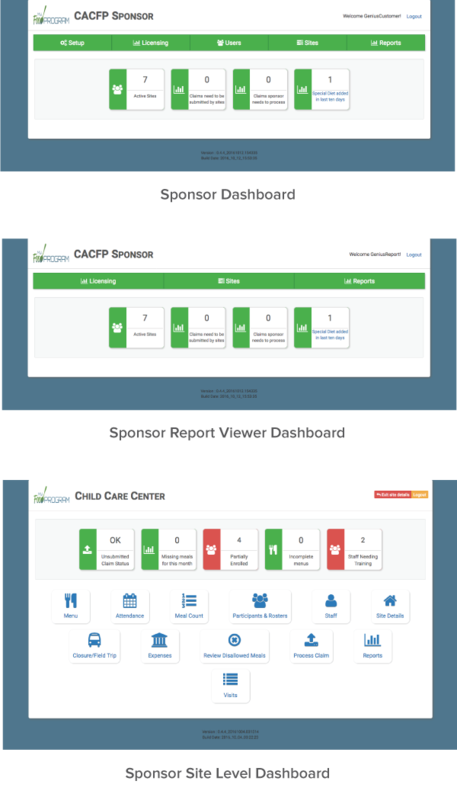 Incomplete: This is for a participant that is missing CACFP paperwork. 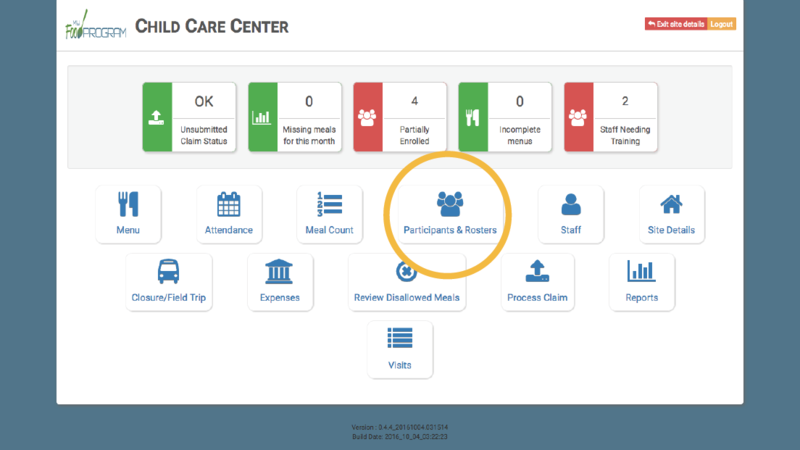 You should still collect meal count and attendance information for participants with an “incomplete” status, however My Food Program does not include meals in the final counts if a participant is missing an enrollment form. Participants that are missing income eligibility forms are counted in the “C” category. Input the address where the PRIMARY guardian and/or the participant are living. The Household Address and Guardian fields are not required. You can fill out the other information if you wish, but it is not required to begin tracking participation. Allergies and Notes: These will trigger an alert on the mobile app to remind staff that there are participants that have allergies. If they “long press” on the name of the participant, they will be able to see what is populated in the “Allergy” field, as well as what is in the “Notes”. As an example, if a participant has an allergy to peanuts, you would enter “Peanuts” in the “Allergies” section. If they also carried an Epi-Pen in their backpack, you would add “Carries Epi-Pen in backpack.” to the “Notes”. These will now be visible to anyone who logs into the mobile app and selects the roster that this participant is on. It WILL NOT alert people who DO NOT have this participant on their roster. 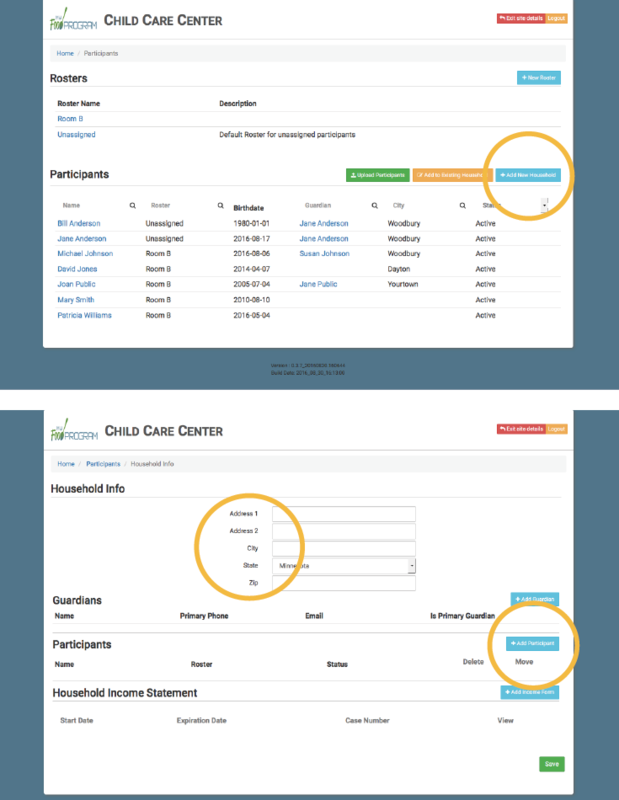 Click the “Participants and Rosters” icon then select the orange “Add to Existing Household”button. On the list of existing households, select the appropriate household to add the participant to and click “Edit Household” on the left. Note:The blank lines are for participants without any Guardian information entered. Fill out their required information. From the menu below the “Schedule” header you will have a drop-down menu that has a list of siblings in the same household as this participant. 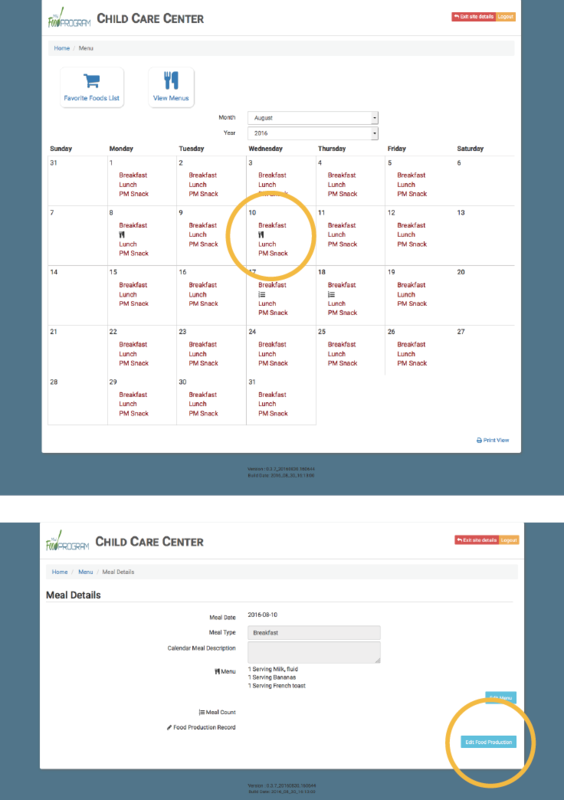 Select the sibling you want to copy and click “Copy Schedule”, this populates their schedule with the same hours and meals as a sibling. Note: In households with more than two siblings, you will be prompted to select from a list. This is for the case that the siblings are in different parts of the programs and will be eating different meals (the prime example is Infants). This way you could select the older sibling to copy instead of the first one that was input. 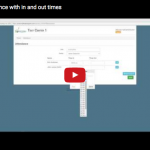 Depending on your site type and the regulations in your locale, you have either “Present” or “In/Out Times” as your attendance tracking. 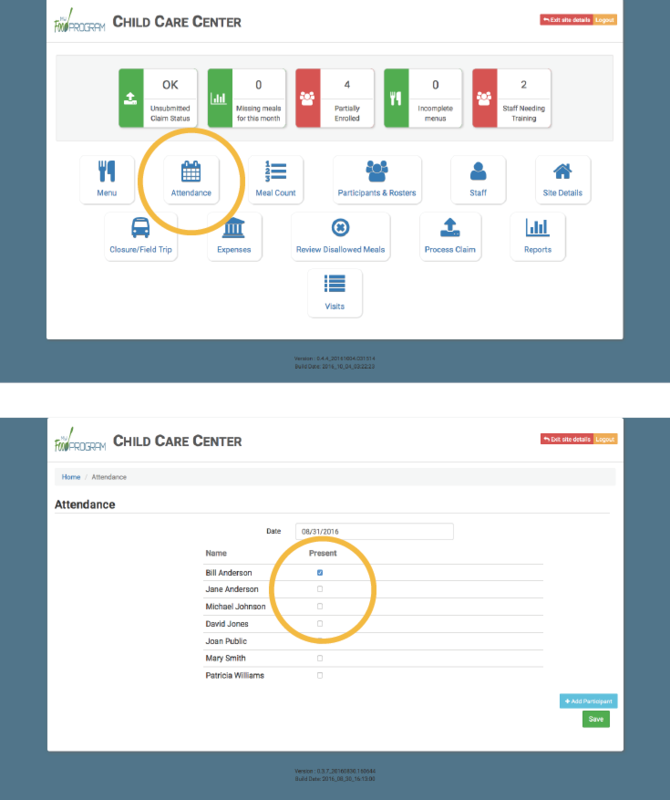 Click on the “Attendance” icon. You will see today’s date and a list of all participants. Select those that are present. This information will be saved to the database and will synchronize when you click “Save”. Other people who login or refresh their screens will see these people as checked in. It will also synchronize in real time with the mobile app. Click on “Attendance”, you will see today’s date, a roster selection box, and a list of participants on that roster with boxes for “Time In” and “Time Out”. If you click on these boxes, a time/date menu will drop down and allow you to select the time (with increments of 1 minute) that they arrived and that they left. Remember to click “Save” at the lower right. This information will be saved to the database and people who login or refresh their screens will see these people as checked in. It will also synchronize in real time with the mobile app. 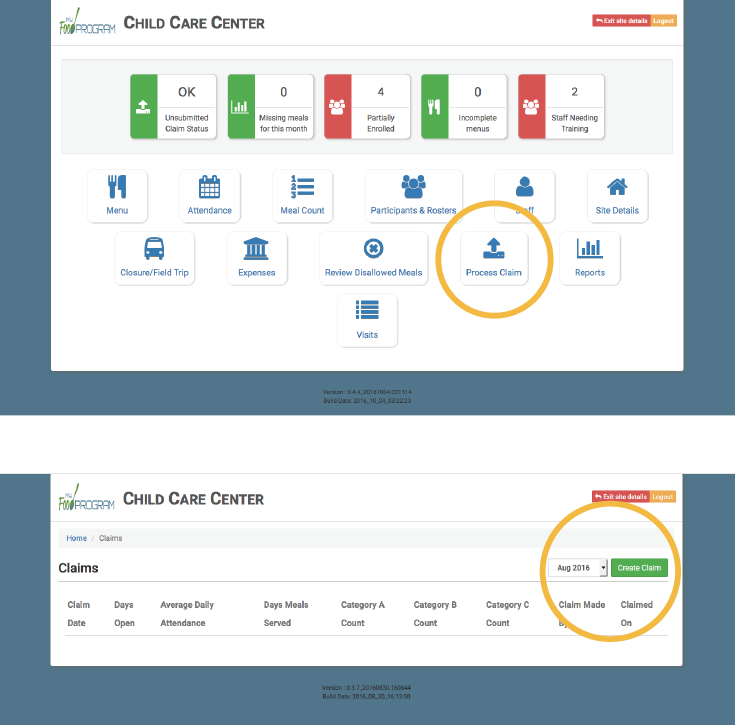 If a child leaves and then comes back (they were not present continuously), you can click the “+” on the far right of the screen and add an additional time in/out for that participant. This way if you wanted to use a report on the duration of time that a participant was present, it would be accurate. Note: If a participant is NOT checked in but is then later checked as eating a meal, the system will automatically mark them as attending, deducing that you could not have been served a meal without having been there. It WILL NOT work in the other direction, marking someone as attending DOES NOT mark them as having eaten the meal. 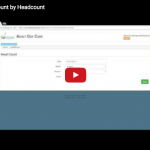 Depending on your site type and the regulations in your locale, you have either “Headcount” (with or without roster) or “Roster” and you may have to take that meal count by the “Day” or at “Point of Service”. Click on “Meal Count” icon and select the correct meal (and the roster if it is selected). Then you can either type the number in, or use the arrow keys on either side of the box to increase or decrease the count. 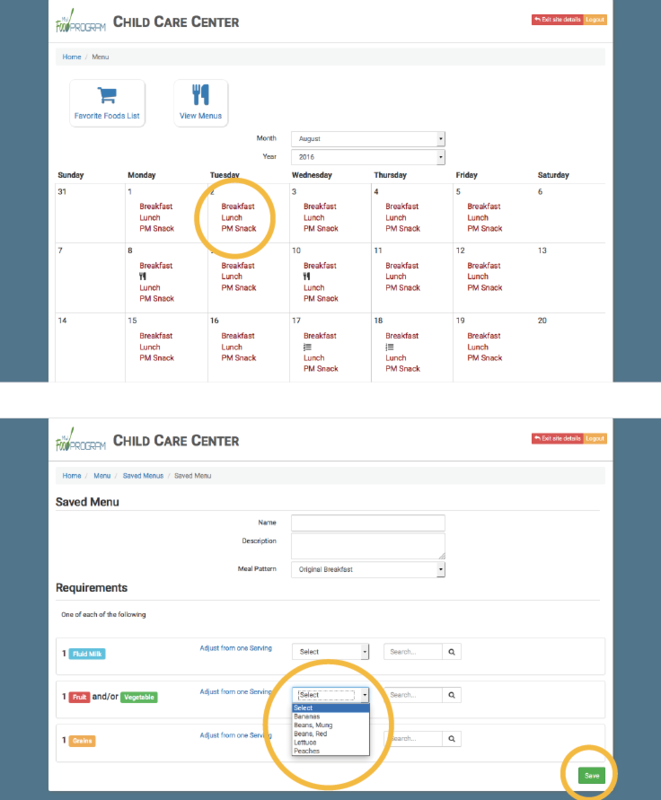 Once a headcount has been entered, a list icon appears on that day and meal in the menu calendar to indicate that meal counts have occurred. 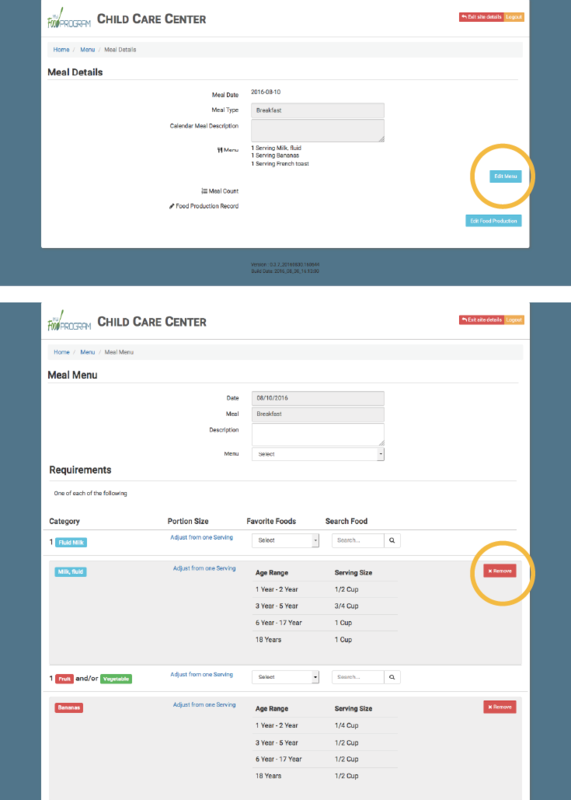 Click on “Meal Count” and select the correct meal and roster. A list of participants will now be loaded. Check the box under “Ate” for all of the participants that ate the meal and click “Save”. 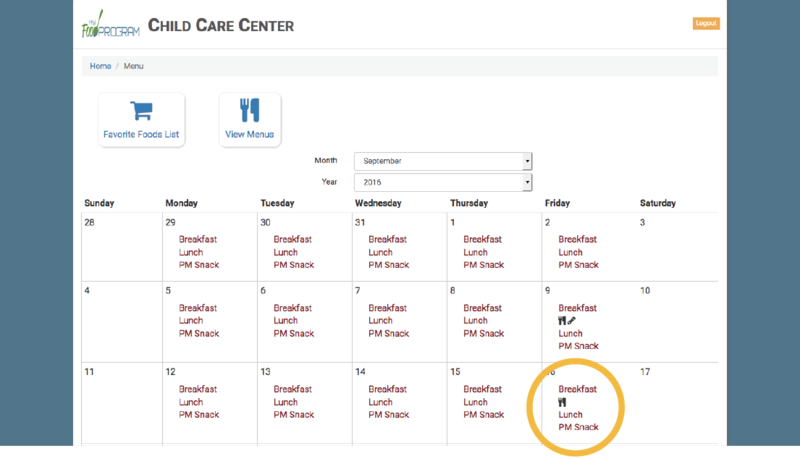 Note: If you are attempting to serve a meal and there are no options under the “Meal” drop down menu, you are serving a meal outside of the scheduled meal time. This is not allowed under the USDA guidelines, please contact your Sponsor Admin. Note: The system will not immediately reject a headcount above the number of participants on your roster or at your site. However, any overage will show up on the disallowed meals report, where the system checks the number of participants against the headcount, overages will be rejected at this stage. 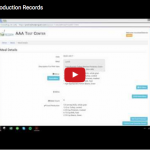 If you are required to create and maintain Food Production Records there are no time restrictions, however, users can’t enter a Food Production Record if a menu has not been entered. 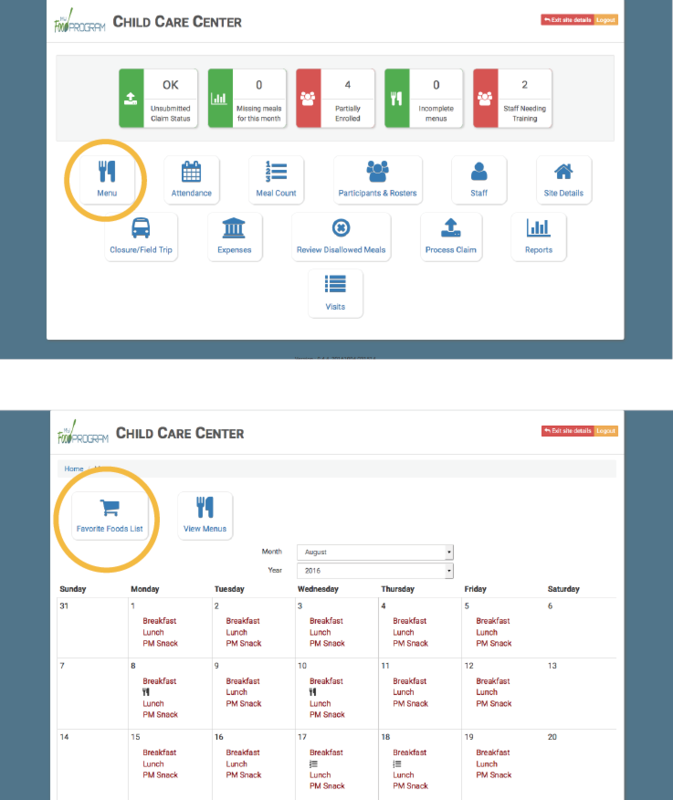 Click the “Menu” icon, then click the individual day and meal that you want to create the food production record for. You will see the date, the meal type and the Menu items that are to be served. Click on the box in the lower right hand corner labeled “Edit Food Production”. On the left side, type the number of participants in each age group that will be eating this meal. Then click “Estimate Production”. You will now have the quantities of the different ingredients in their typical measuring units. Reflect the quantities in the estimates to the actual amount prepared and then click “Save” in the lower right corner. A “Pencil” icon will now appear on the menu calendar for that day and meal, indicating that a food production record exists for that meal. This information will be saved to the database and people who login or refresh their screens will see these food production records. Note: Menu items MUST be present in order to do any work with food production records. 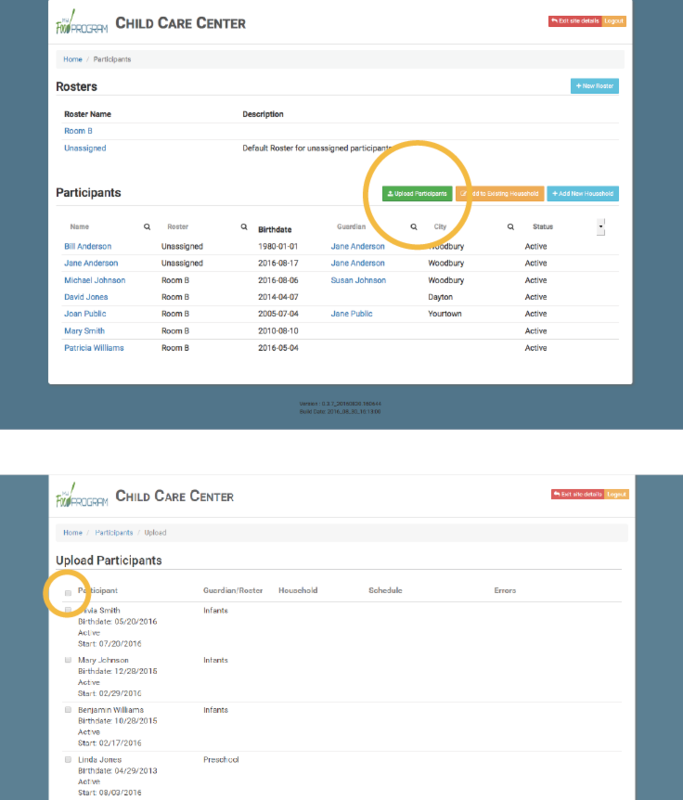 Users can edit the Food Production Record as long as a meal has not been submitted in a claim. This feature is meant to communicate that the site is either closed entirely on a day that it would normally be open or that meals are being served offsite. It is intended to prevent miscommunication of an unannounced visit by a sponsor performing an audit. If the auditor were to login and check for field trips and closures, they could find this information here. 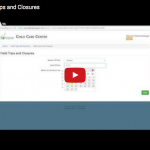 From the dashboard click the “Closure/Field Trip” icon. Now you will see a list of existing dates, reasons and meals that are not being served at the site. To add a new event, click “+Add” in the upper right hand corner. Choose the Reason (Field Trip, Closure, Holiday) from the drop-down menu. Then enter the date in the box “Date Off Site” and select only the meals that WILL NOT be served onsite. Remember to click “Save” when you are done. From the dashboard click the “Closure/Field Trip” icon. You will now see a list of all events that have been entered into the system. 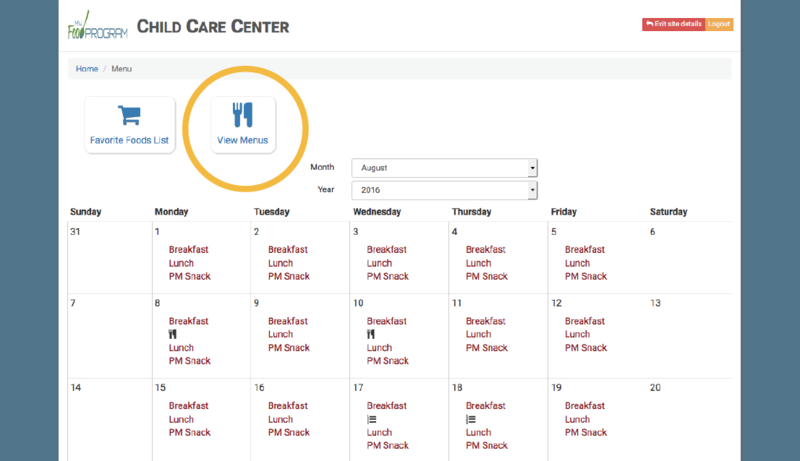 Note: This feature is not directly linked to the meals that are served at your site and shows all possible reimbursable meals on the list. Since it is still possible to serve meals, meal counts are not prohibited by this feature. It is meant to be information only to prevent an auditor from going to your site when you are not serving meals there. Note: Adding a date and meals will not actively notify anyone that they are input here. This is because the person doing the audit is not always known or may change. It is best to have the sponsor administrator check this information whenever an unscheduled audit is planned. 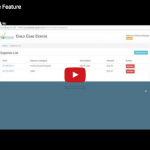 The Expenses feature is a simple and flexible place to store and track expenses related to your site. You can have multiple people add expenses to this location and then total it up on your own. Entries here are retained only until they are deleted (there is no backup for deleted entries). From the dashboard click the “Expenses” icon. You will now see a list of items that have been added previously. 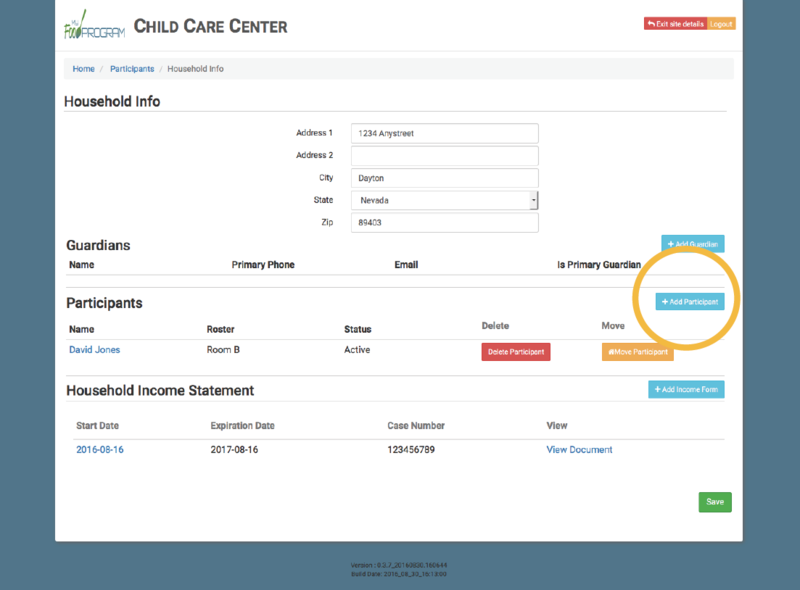 Click “+Add Expense” on the upper right, fill in the expense date, the IRS Business Expense Category, the description and the amount. You can also upload an image (such as a picture of a receipt that could be downloaded by anyone who has access), but it is not required. From the dashboard click the “Expenses” icon. You will now see a list of items that have been added previously. To delete an expense, click the “X Delete” button under the action column. Note: There will not be a permanent record of any data that has been stored here, and when you click “X Delete” the record is deleted instantly and permanently. The meal errors screen shows which meals have been served that had either a missing menu or were missing food production records (if these are required). 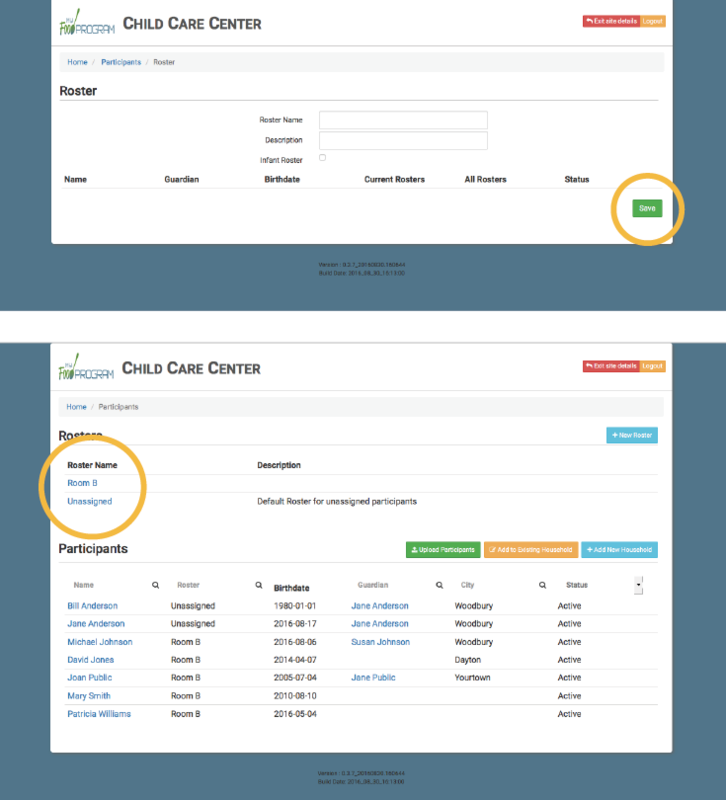 This allows a Site Manager/Director an opportunity to input the missing information before the claims are submitted to the Sponsor. From the dashboard click the “Review Disallowed Meals” icon. 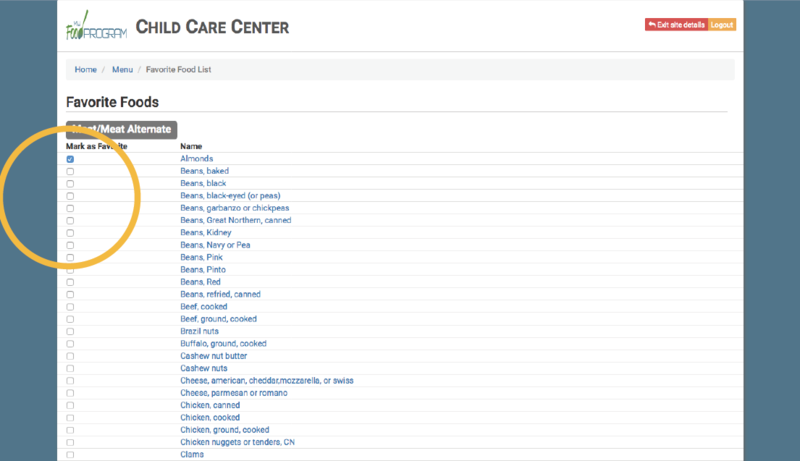 This will display a list of meals that have been entered, but are lacking one of the required items (menu for example). Note: This feature gives you a “snapshot” of what errors have been recorded up to this point so that you have the opportunity to fix them before submitting this information to the Sponsor Admin to claim them. The function of submitting a claim should be done by the Site Manager/Director to a Sponsor Admin. It is included here only to clarify the process. After checking meal errors and resolving any that have occurred, you can review your claim and send it on to your sponsor for reimbursement. From the dashboard click the “Process Claim” icon. 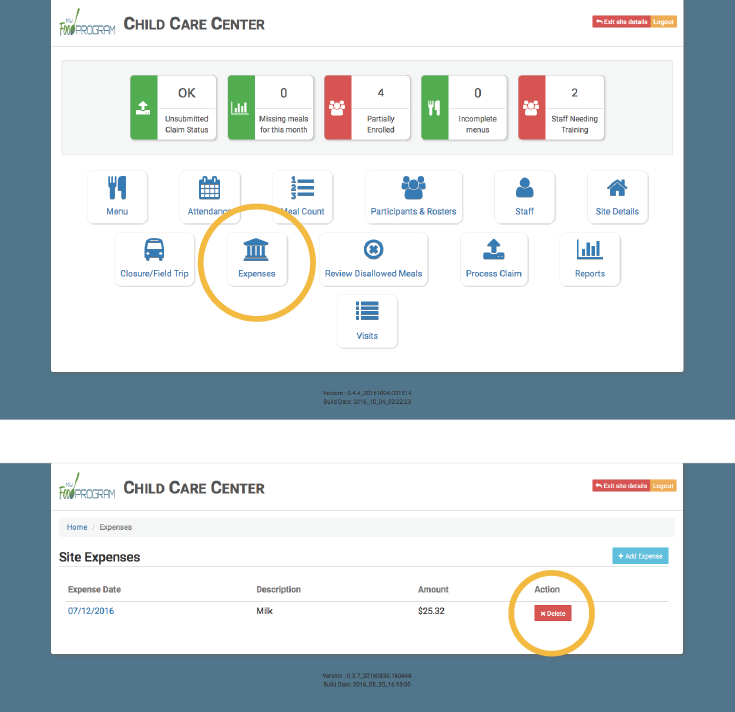 Select the month you want to review from the drop-down menu on the right hand side, click “Create Claim”. 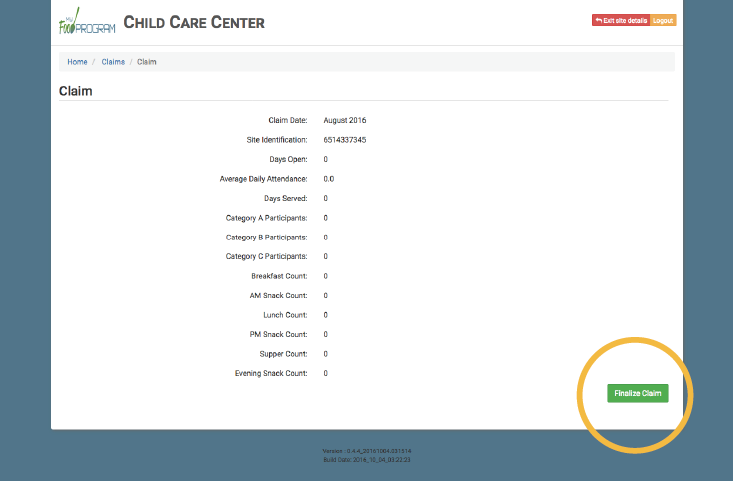 This will populate the screen with the Claim Month, Site ID, Days Open, Average Daily Attendance, Days Served, Category A, B and C participants (for Child Care Centers), Tier I and II count (for Child Care Homes), and your meal counts for each meal served. If you are satisfied that this is accurate (all meal errors that can be resolved have been corrected), click “Finalize Claim”. Note: Once you click “Finalize Claim” you can no longer edit any information regarding this claim, as it is locked and sent to your sponsor for review. You can view this data at any time. Note: Only Site Manager/Directors can finalize a claim. 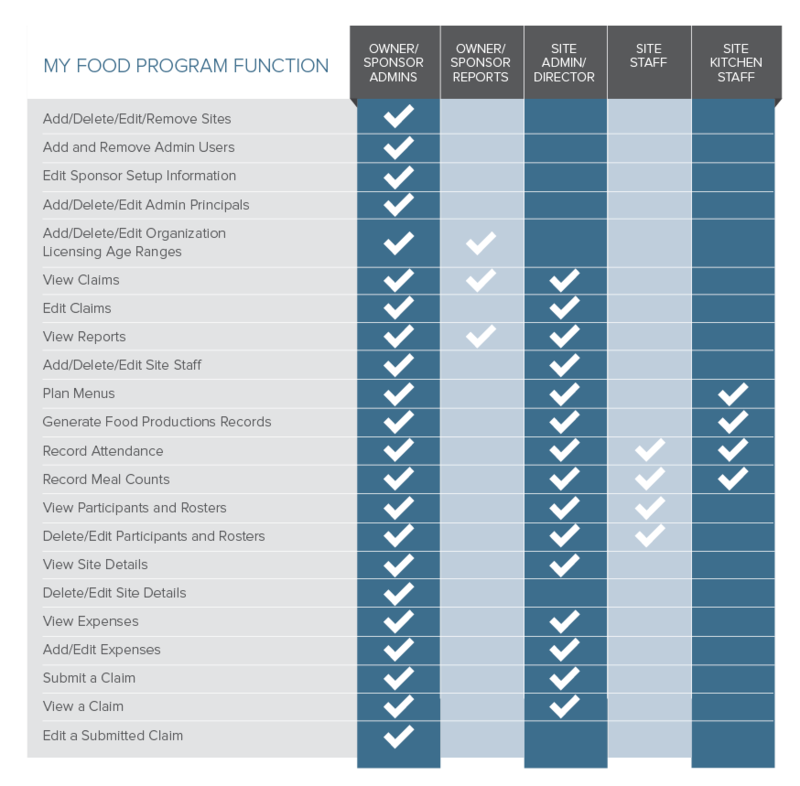 There are reports that can be run by Sponsor Admin and Site Manager/Directors to see activity that has occurred at your site since it was setup in My Food Program. If your account is active, you will always have access to this information, though you may not edit anything after it is submitted. From the dashboard click the “Reports” icon. Click on the report you wish to run (Participant, Disallowed Meals, etc). 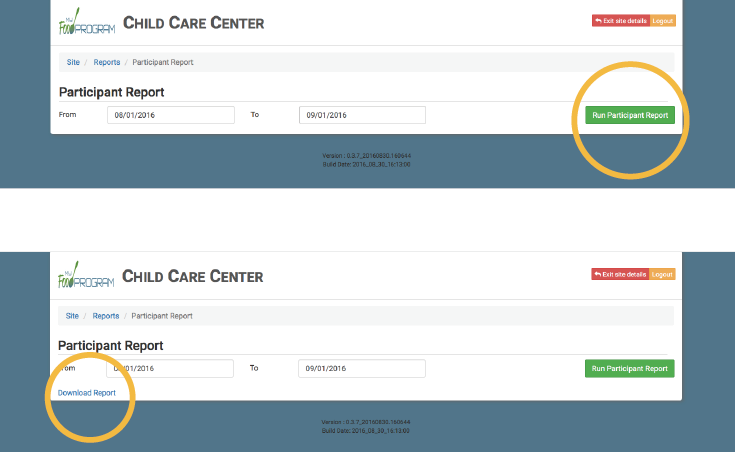 Select a date range for the report, click “Run Report”. A link will appear at the bottom that says “Download Report”. You can either left click it to open it immediately or right click and select “Save As” to save it without viewing it first. 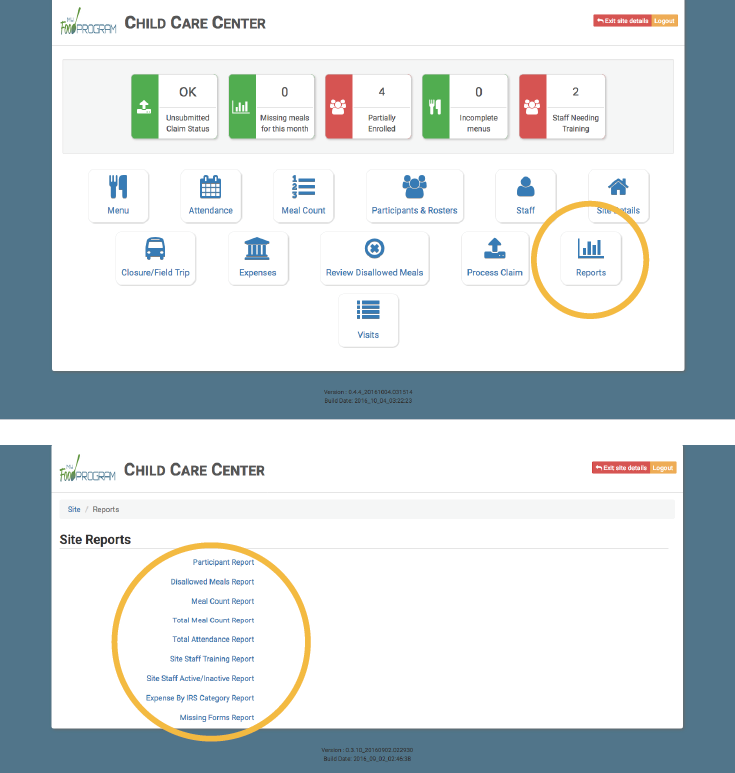 Note: Depending on the number of events recorded, it can take several minutes to generate and download your report. This is a normal function of the system. Please do not “refresh” or run your report repeatedly during this time. 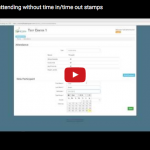 Download the Claims Processing tutorial for simple step-by-step instructions.